Pregnancy, birth and motherhood as an American in Switzerland. 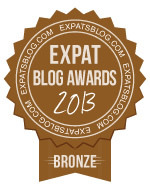 ExpatsBlog.com Expat Blog Awards 2013: Switzerland Bronze Award! This blog won the Bronze Award for best expat blog in Switzerland! This blog is just the right mix of silly and serious. If you like to learn and laugh at the same time, you will LOVE swiss lark!! So happy I came upon this blog a few months ago! It has been so helpful to us and so much fun to read!